Book by Hugh Wheeler. Based on a version of Sweeney Todd by Christopher Bond. Music and lyrics by Stephen Sondheim. The original Broadway production opened on 1 March 1979 and was directed by Harold Prince with dance and movement by Larry Fuller, running for 557 performances. It is 19th-Century London and in an area of town known as Fleet Street, an organ plays funeral music while two gravediggers begin to dig a grave. A factory whistle is heard the audience is invited to listen to the tale of Sweeney Todd (THE BALLAD OF SWEENEY TODD). Sweeney Todd rises from the grave and the play begins. On an early morning in the recent past, a young romantic sailor and an embittered forty-year old man arrive in London at the docks of the Thames. The sailor, Anthony Hope, rescued the man, Sweeney, at sea. As they share their conflicting views of the city, a half-crazed beggar woman interrupts them, demonstrating the coarser side of the town (NO PLACE LIKE LONDON). Anthony, realizing that Todd is destitute, offers him aid but is quickly rebuffed by the angered man, who relates a story about the filthy deeds of the upper classes of London (THE BARBER AND HIS WIFE). The two say goodbye and Todd heads for Fleet Street, where Mrs Lovett, the slovenly and conniving owner of a grubby meat pie shop, is busy shooing flies away from her main source of income. She is overjoyed to see a customer but warns Todd that hers are THE WORST PIES IN LONDON. When he asks her about renting a vacant room upstairs from of her shop she tells him the story of the former residents, an unfortunate barber and his wife. Having dispatched the barber to Austalia, the lecherous Judge Turpin offered to care for his wife and baby daughter. When the barber’s spurned his advances, the judge raped her in front of a group of party guests (POOR THING). Mrs Lovett concludes her tale with the news that the wife died and the daughter, Johanna, was taken in as Judge Turpin’s ward. When Sweeney reacts strongly to the story Mrs. Lovett recognizes him as the barber, Benjamin Barker. He assures her he is no longer Benjamin Barker. Reborn as Sweeney Todd, he has returned to gain his revenge. Mrs Lovett offers him the upstairs room and returns his barber equipment, which she had safely stored for his return, to him. Sweeney eyes the sharp razors and an idea begins to take its bloody shape (MY FRIENDS). At Judge Turpin’s home, Johanna (now sixteen), has grown into a beautiful woman. However, she is naively unaware of the judge’s evil lechery. She appears at the balcony as a bird seller walks by and mournfully compares her life to that of a caged bird (GREEN FINCH AND LINNET BIRD). Anthony, who happens by, is instantly enamored, but Johanna is frightened inside by the sudden appearance of the beggar woman (AH, MISS) who warns Anthony to avoid the house of Judge Turpin. Ignoring her advice, Anthony gives a bird to Johanna, who shyly offers him her hand as the Judge arrives and orders her inside. The Judge sends Anthony away and the Beadle adds to the menace by strangling the bird. As the two go inside, into the house Anthony vows to steal the unhappy JOHANNA from the evil judge. At a nearby market place, a fraudulent Italian barber, Aldolfo Pirelli, has set up his cart for his weekly Thursday haircuts and bald remedy sales. He is announcing his latest elixir with the help of his young assistant, Tobias, when Sweeney and Mrs Lovett arrive (PIRELLI’S MIRACLE ELIXER). Sweeney challenges the egotistical barber to a shaving CONTEST which he easily wins. His reputation is assured when the Beadle, promises to visit his shop within the week. In his shop, as Sweeney impatiently awaits the arrival of the Beadle, Mrs Lovett urges him to be patient (WAIT). Anthony bursts in to ask Todd to use the shop as a resting place for Johanna, whom he intends to steal from Judge Turpin. Todd happily agrees and the lad rushes from the shop. Pirelli arrives with Tobias, asking to speak to Todd alone. Mrs Lovett takes Tobias down to the pie shop as Pirelli, who has recognized Todd as Benjamin Barker, attempts blackmail. Todd slashes his throat and stuffs the dead Pirelli in a nearby trunk. Meanwhile, Johanna confides to Anthony that she will kill herself if the judge pursues his desire to marry her. Anthony assures her that he will save her (KISS ME). The Judge, on his way home after a long day of passing unjust sentences, confides to the Beadle his desire for Johanna. The Beadle directs him to Sweeney’s shop to get a shave and a haircut (LADIES IN THEIR SENSITIVITIES). Anthony outlines his plan for escape as Turpin decides to visit the now famous barber. The Judge arrives at Sweeney’s and Sweeney prepares to slit the Judge’s throat (PRETTY WOMEN), but Anthony bursts in to announce his marriage to Johanna. The Judge leaves, promising to remove Johanna from Anthony’s reach and Todd orders Anthony from his sight. Mrs Lovett enters to hear Sweeney’s EPIPHANY: he vows to practice his killing until the Judge returns. He is beginning to grow demented but Mrs. Lovett forces him back to the reality of disposing of Pirrelli’s body. When she decides that burial would be a waste of a potentially good filling for her pies, the two spiritedly connive (A LITTLE PRIEST). Soon, Mrs. Lovett’s pie shop is so successful she has added an outdoor dining area to seat the newly acquired customers. Tobias, Pirelli’s former slow-witted assistant who is still waiting for his master to return, helps dish up the pies (GOD THAT’S GOOD!). Meanwhile, Anthony is searching the streets for Johanna, who Turpin has incarcerated in a mental asylum, and Sweeney is testing his newly designed barber chair which slides the victims to the kitchen below. The beggar woman is screaming a warning about Mrs. Lovett’s pies (JOHANNA). At the end of the day, Todd rests in the parlor while Mrs. Lovett counts her money. She tries to take Todd’s mind from the judge by verbally painting a vacation spot the two of them could enjoy in married comfort (BY THE SEA). Anthony interrupts to tell Todd he has found Johanna in a mental asylum. Todd quickly devises a plan to disguise Anthony as a wigmaker, who can easily gain admission to purchase human hair from the inmates. When Anthony leaves, he drafts a note to the judge stating that Johanna will soon be at his shop. He vows that the Judge will not escape his vengeance again. Tobias tells Mrs. Lovett he appreciates her kindness, and will protect her from any danger (NOT WHILE I’M AROUND). During their conversation, he discovers that Todd has killed his former boss but Mrs. Lovett lures him to the baking cellar and quickly locks him in before he can alert the police. When she enters the house, she finds the Beadle in the parlor and joins him in some songs – hoping that Todd will return (PARLOR SONGS). At last Todd arrives and escorts the Beadle upstairs to slit his throat. Tobias, in the bake-house below, hears a noise from above as the Beadle’s bloody body is deposited down the chute. He screams in terror for he has at last realized the exact ingredients of Mrs. Lovett’s pies. Anthony rescues Johanna who shoots her captor. As they run off, the inmates tear down the wall and escape to the street (CITY ON FIRE). In the cellar, Tobias sees Todd kill the beggar woman, whom he discovers is his long lost wife. He fulfills his vengeance, by killing the judge and gains revenge on Mrs. Lovett, who let him believe his wife was dead, by throwing her into the oven (FINAL SEQUENCE). As Todd mourns his dead wife, Tobias, who has gone stark raving mad, seizes the razor and slits Todd’s throat, bringing the tale to the point at which the audience arrived (THE BALLAD OF SWEENEY TODD). From left to right above: 1. Sweeney Todd Original Broadway Cast Recording CD. 2. 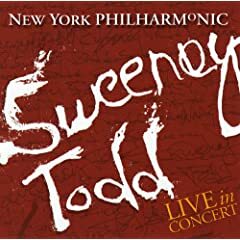 Sweeney Todd Concert CD. 3. Sweeney Todd Broadway Revival Cast CD. 4. Sweeney Todd Soundtrack CD (Complete Edition). 5. Sweeney Todd Karaoke/Accompaniment CD. From left to right above: 1. Sweeney Todd DVD of Broadway Production on Tour with Angela Lansbury and George Hearn. 2. Sweeney Todd Concert DVD with Patti LuPone and George Hearn. 3. Sondheim Collection: (Into the Woods/Sunday in the Park with George/Follies in Concert/Passion/Sweeney Todd in Concert/A Celebration at Carnegie Hall). 4. Sweeney Todd Film DVD. 5. Sweeney Todd Film Blu-Ray. From left to right above: 1. Sweeney Todd: The Real Story of the Demon Barber of Fleet. 2. 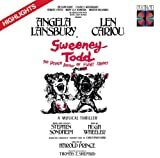 Sweeney Todd Complete Book and Lyrics with Illustrations, also includes A Little Night Music, Sunday in the Park with George and A Funny Thing Happened on the Way to the Forum. 3. Sweeney Todd Study Guide. 4. Sweeney Todd Complete Vocal Score. 5. Sweeney Todd Vocal Selections.